This text provides a treatment of the law relating to compensation for personal injuries. 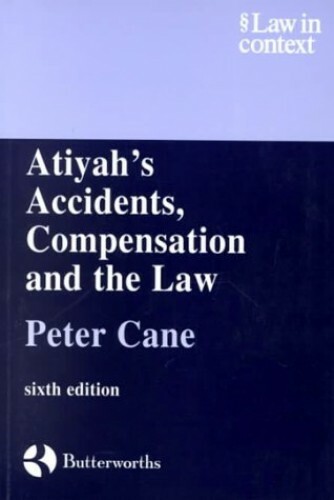 Atiyah's Accidents, Compensation and the Law has been recognised as a classic treatment of law relating to compensation for personal injuries. It discusses not only relevant legal rules, but also social, political and economic issues underlying the law, the practical operation of the tort system, and the options for change. This new edition has been thoroughly updated with many sections such as those on causation and the financing of tort claims being substantially rewritten to include major changes: the introduction of no-win-no-fee conditional fee arrangements and the radical reform of the Criminal Injuries Compensation Scheme.